We are so excited to be participating in the #write_on Challenge (writeoncampaign.com) to write 30 letters in 30 days throughout the month of April. April is Letter Writing Month! Please join us for our 30 day Letter Writing Launch Party on Thursday March 30th at Paper Umbrella. Gather with fellow letter writers that evening (and throughout the month at partner venues) to share in the joy of writing letters. Everyone is welcome. This Fall, we had the opportunity to visit Egg Press In Portland, Oregon where we learned about the letterwriting challenge: to write 30 letters in 30 days during the month of April, National Letterwriting Month. It inspired us to launch our own campaign here in Regina to promote joy, creativity, expression, and connection through hand-written correspondence. Join the letter writing movement by sharing your photos with us on Facebook and Instagram with hashtags #write_on #write_onYQR #paperumbrellask By choosing to use the #write_onYQR hashtag you will automatically be entered to win a prize on April 30. * Remember to bring your favourite writing supplies for a fantastically fun letter writing night! 1 sheet to track your letters - 30 spots for all 30 days of the Write_On Challenge! We're excited to show the work of Saskatchewan artist, Sue Bland. 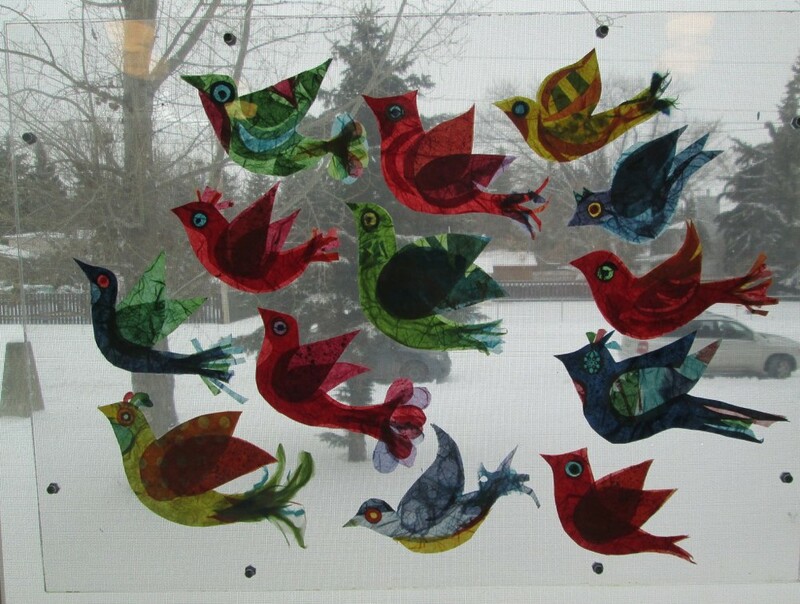 Her paper collage work using rice papers are currently on display in our windows. It is a delight for the eyes in all types of winter light; a little colour to counterbalance the January days. I hope you will take the time to enjoy them as you walk down 13th Avenue. May all your paper dreams come true this Christmas. Wishing you all the joy that comes with creativity and imagination!! Celebrate with us - for 24 hours! For the 5th consecutive year, we are so pleased to open our doors for a full day starting at 10:30 this morning! This event coincides with what has become a neighbourhood wide event called Light Up the Village with 14 additional businesses staying up late serving up deals, warm drinks and friendly smiles. Please join us for some holiday fun! Who do you consider tough? To celebrate the first time the Saskatchewan Roughriders will play in the 101 Grey Cup here in Regina, we reflected on the tough people in our lives besides the burly football players who generate so much provincial pride. Brad chose his 97 year old Grandma, Kay. She agreed to pose for our billboard, and we've had lots of terrific feedback about what it takes to be Saskatchewan tough. We'd love to hear who inspires you.